SEE and FEEL the difference! 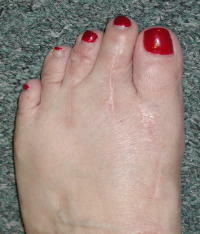 Example of Dr. Lee's Restorative Foot Surgery™ for bunions where the scars are concealed. A concept developed by Dr. Lee which combines the best of reconstructive foot surgery with plastic cosmetic surgery to bring you truly beautiful results. He believed that most surgeons corrected the mechanical function of the foot with surgery, but they neglected the cosmetic appeal by leaving unsightly scars or toe shapes and appearances. Influenced by his personal relationships with renown plastic surgeons in Southern California, he developed techniques and incisional approaches which allowed the full restoration of the feet while enhancing the physical appearance. It's a unique combination that one can only appreciated by seeing the before and after photos of his patients. Surveys show that most people are concerned about the way their feet look after a foot surgery. Many will undergo foot surgery and be left with large and/or unsightly scars, not realizing that the vast majority of surgeons do not use Restorative Foot Surgery™techniques (ability to concealing the incisions). Our surgeons at CosmeticFootSurgery.com are board-certified foot and ankle surgeons who specialize in Restorative Foot Surgery™ surgery. All procedures are performed to the highest standards addressing both mechanical function AND physical appearance. Can Restorative Foot Surgery™ be performed if I don't have any pain? Restorative Foot Surgery™ can be performed on patients where the concerns are solely the appearance (aesthetics). This remains possible since our techniques provide aesthetic results and maintain or enhance the mechanics of the foot to the minimum pre-operative activity level of the patient. In most cases, however, patients present with concerns about physical discomfort in addition to the desires for an improved physical appearance. 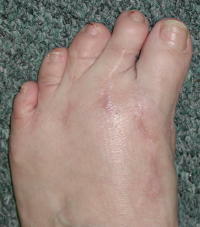 Examples of a non-cosmetic bunion surgery where the scars are visible over the great toe joint. 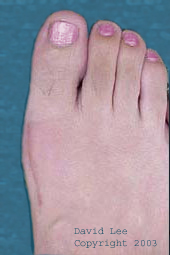 Example of Dr. Lee's Restorative Foot Surgery™ for; webbed toes (syndactyly). Although the large majority of foot surgeries lead to successful outcomes complications can develop leading to undesirable foot conditions. Dr. Lee specializes in reconstructive and cosmetic foot surgery using Restorative Foot Surgery™ techniques and may be able to assist you in regaining foot function and appearance. Case #1: Patient had bunion and hammertoe surgery with resulted in overcorrection of the bunion. This is called hallux varus and digital varus (Left Photo). Patient had moderate foot pain and could not wear shoes. Restorative Foot Surgery™ of the toes and feet restored foot structure and patient is now able to wear a variety of fashionable shoes (Right Photo). Case #2: Patient had hammertoe surgery. Toes were fused (joints removed) and they healed 30 degrees pointing upward and patient was unable to touch her toes to the ground. This caused much pain to the ball of the foot. Additionally, she couldn't fit into most shoes as the tips of her toes rubbed constantly (Left Photo). Restorative Foot Surgery™ was performed to relocate the position of the toes, slightly lengthen them and restore some motion to the toes. Her toes now touch the ground and she is able to wear shoes without toe irritation (Right Photo).